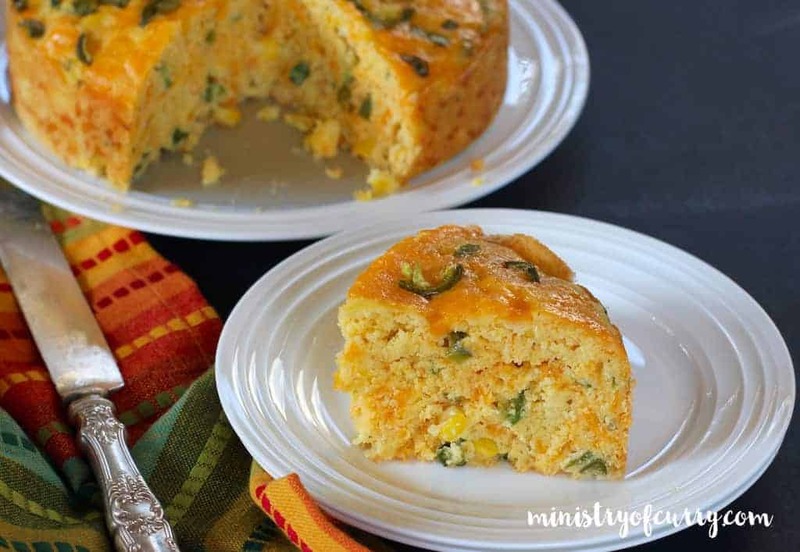 Jalapeño Cheddar Cornbread – A perfect combination of sweet and savory, this buttery, cheesy cornbread is packed with the flavors and earthy aromas of fresh corn and peppers. 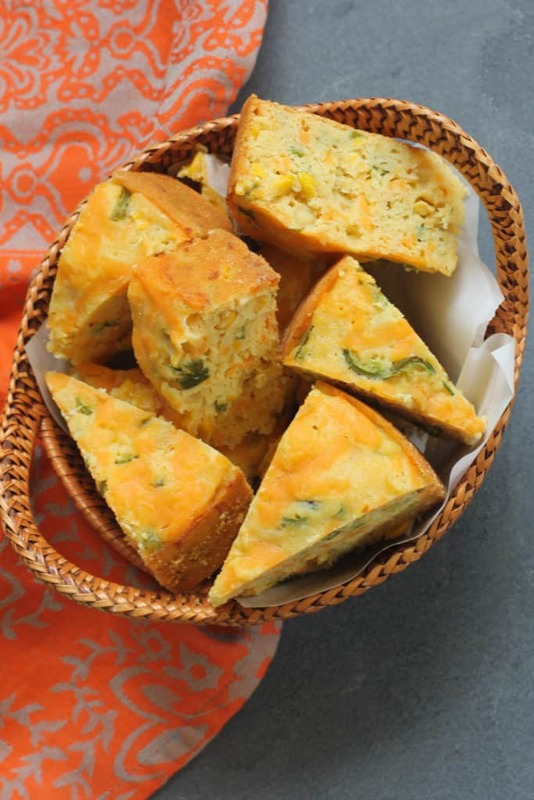 Served warm with chili or soup, this jalapeño cheddar cornbread makes a perfect cool-weather meal or a great side dish for the holidays. 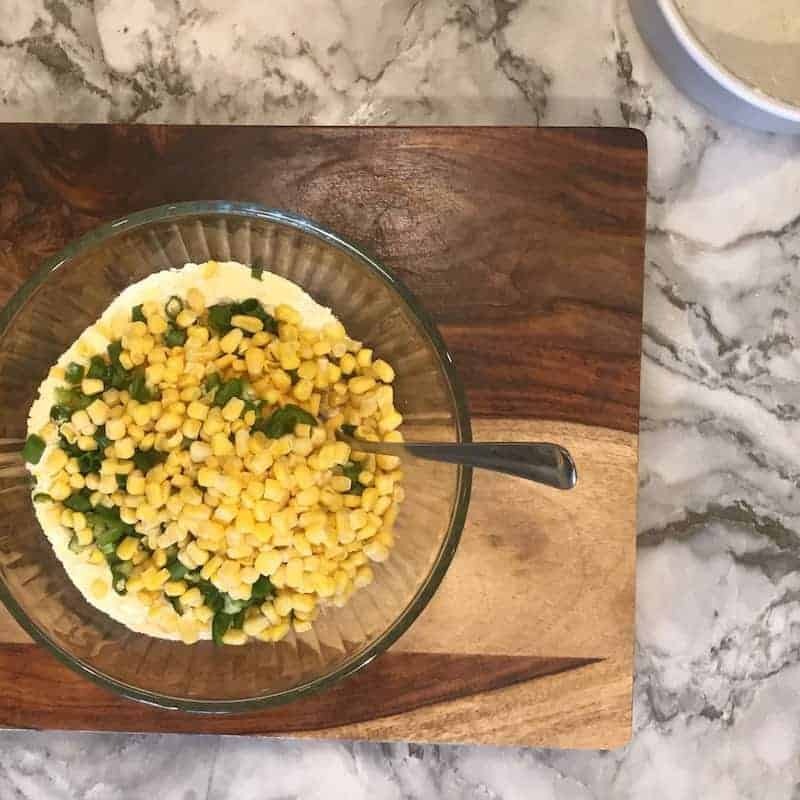 The recipe calls for few ingredients such as cornmeal, flour, cheese, corn, jalapenos and eggs. I have been enjoying baking this cornbread in my oven for several years now. This year I decided to try it in the Instant Pot. As I put the cake pan in the Instant Pot, I had plans to broil this cake for a couple of minutes. Once it was ready and I took it out of the push pan, I was so impressed with the perfectly golden brown sides and gorgeous cheesy top!! At this point, I had forgotten the broiling part and dived straight into trying a piece. I was simply blown away with the soft, melt-in-the mouth textures and the amazing flavors of this cornbread. Note: The original recipe posted in Nov 2017 has been updated with detailed step by step photos and recipe video. Add 1 cup of water to the Instant Pot. Grease and lightly coat 7” cake pan with corn meal and set aside. In a large mixing bowl, combine the cornmeal, flour, baking powder and salt. Mix well. Add the grated cheese, chopped jalapeño and scallions (save 1 tablespoon of each to garnish). Add the corn kernels to the flour mixture. Mix gently until well coated. 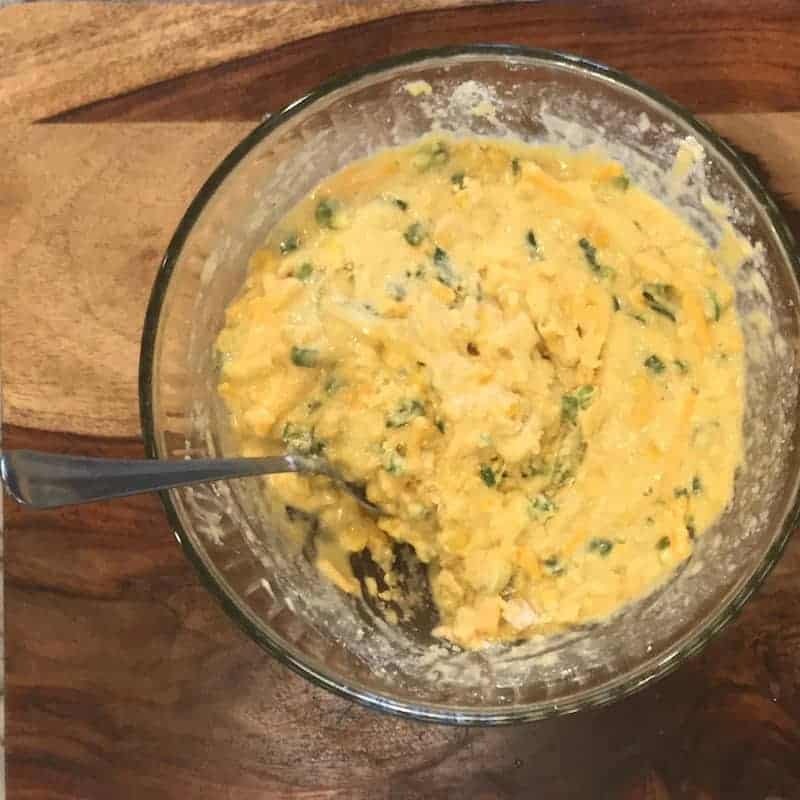 In a separate bowl, whisk together the buttermilk, melted butter, honey, and eggs.Pour over mixed dry ingredients and stir gently with a spoon until just combined. Pour into the prepared cake pan and garnish with the remaining jalapeño and grated cheese. 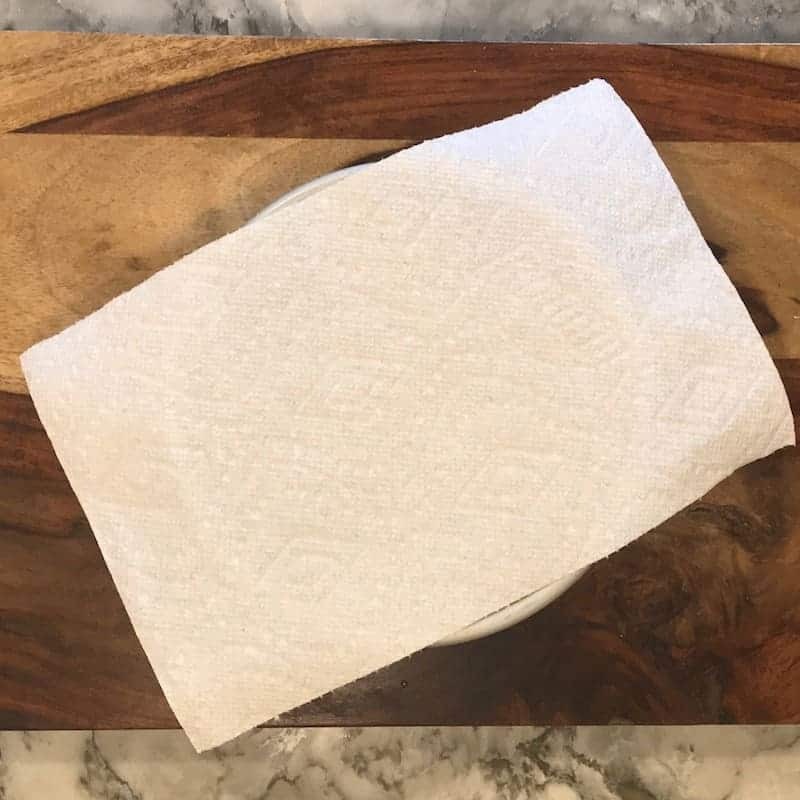 Place a paper towel over the cake pan. Then cover it with aluminum foil and secure the aluminum foil around the cake pan. This prevents any moisture from getting inside the pan. 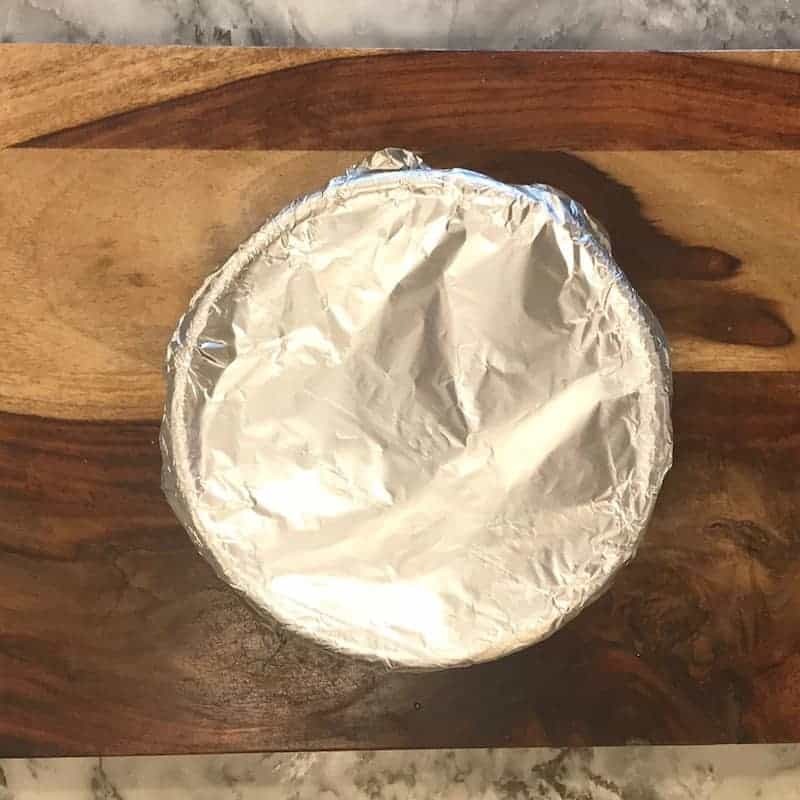 Place the cake pan on the trivet and gently put the trivet in the Instant Pot insert. Cook on pressure cook/manual(Hi) for 30 minutes with natural pressure release. 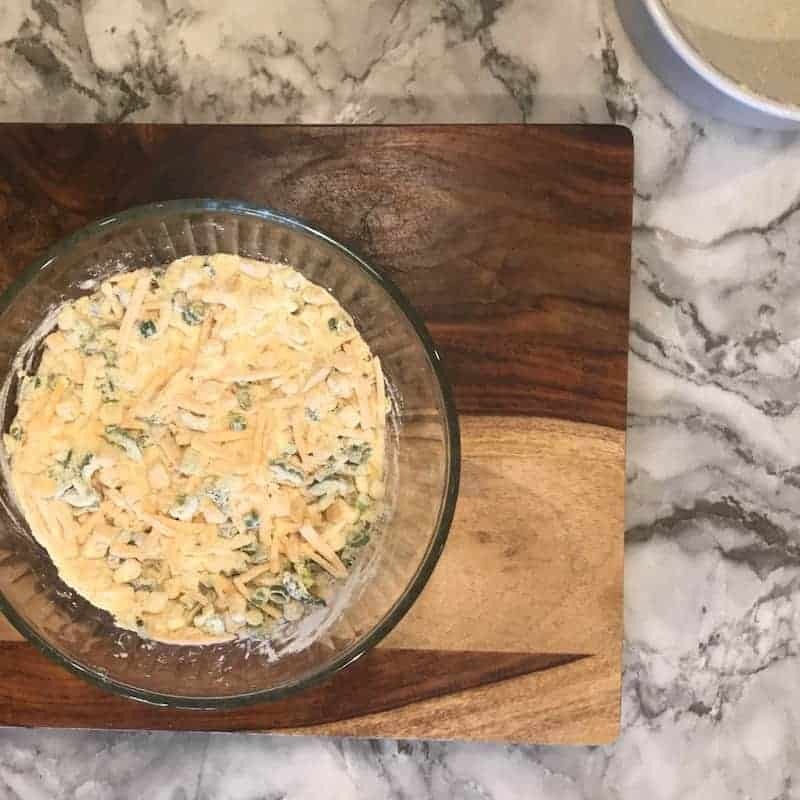 You can optionally broil for 2 minutes to get browned cheese on top. Depending on the temperatures of the diferent ingredients, fresh Vs frozen corn, or if you have accidentaly overmixed the batter, the cake make not be fully done in 30minutes. Simply place the cake pan back in the Instant Pot and cook for additional 5 minutes with a 10 minutes natural pressure release. 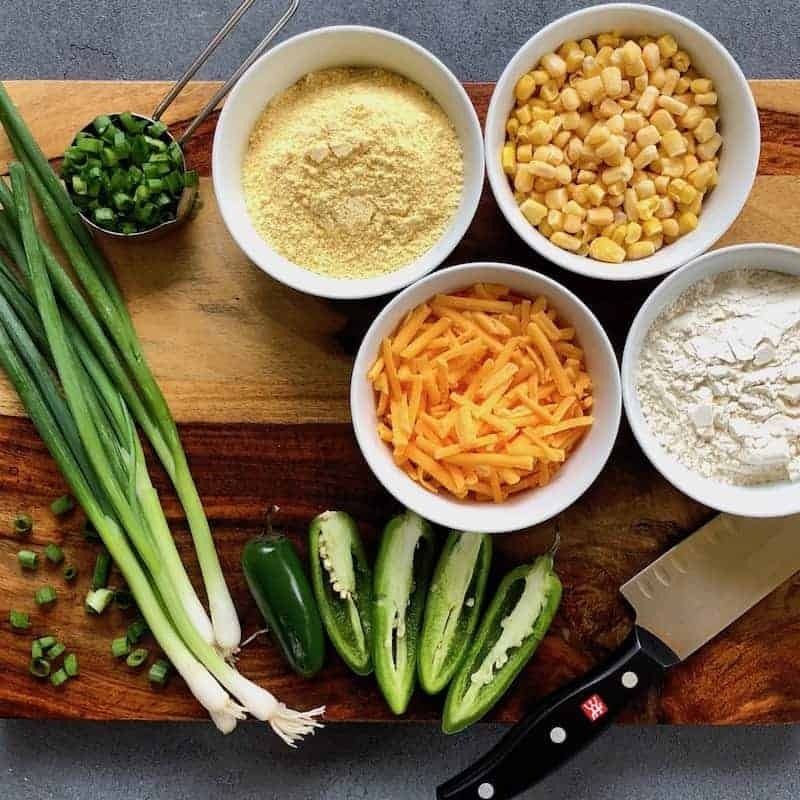 A perfect combination of sweet and savory, this buttery, cheesy cornbread is packed with the flavors and earthy aromas of fresh corn and peppers. 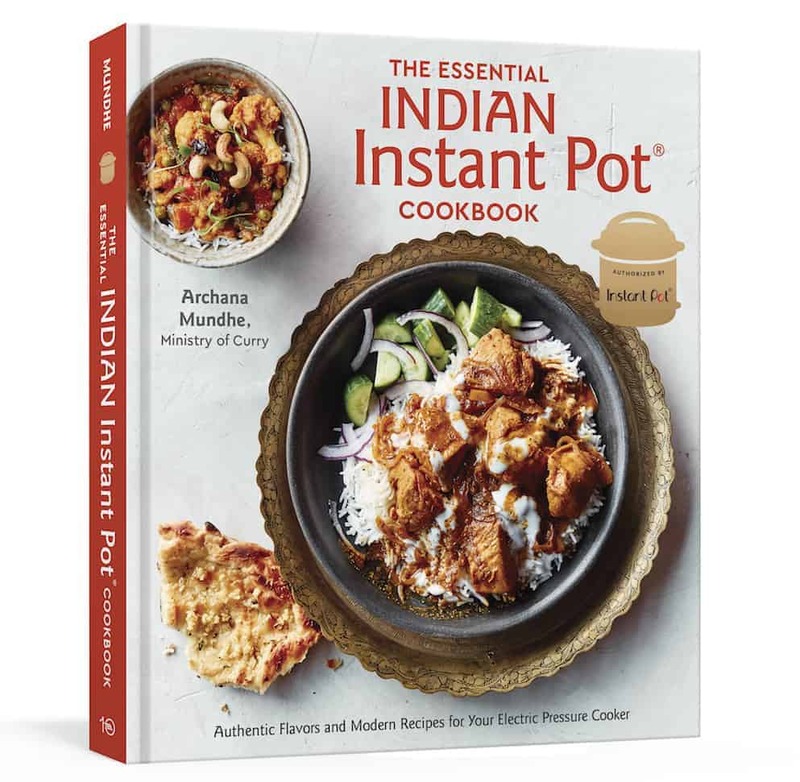 Add 1 cup of water to the Instant Pot. Grease and lightly coat 7” cake pan with 1 to 2 teaspoons of corn meal and set aside. In a large mixing bowl, combine the cornmeal, flour, baking powder and salt. Mix well. Add the corn kernels to the flour mixture. Mix gently until well coated. In a separate bowl, whisk together the buttermilk, melted butter, honey, and eggs. Pour over mixed dry ingredients and stir gently with a spoon until just combined. 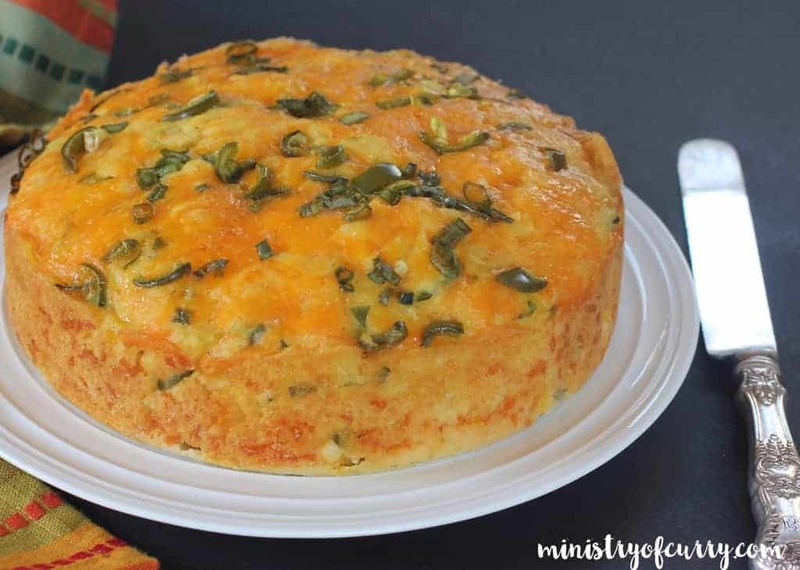 Pour into the prepared cake pan and garnish with the remaining jalapeño, scallions and grated cheese. Simply bake the batter in a preheated oven at 375 degrees for 20-25 minutes. I use a small convection oven which heats up fast, you may need to increase the cooktime to 30-35 minutes or until an inserted toothpick comes out clean. Add or reduce jalapeños, but de-seeding them takes most of the heat out. Dont have Buttermilk? 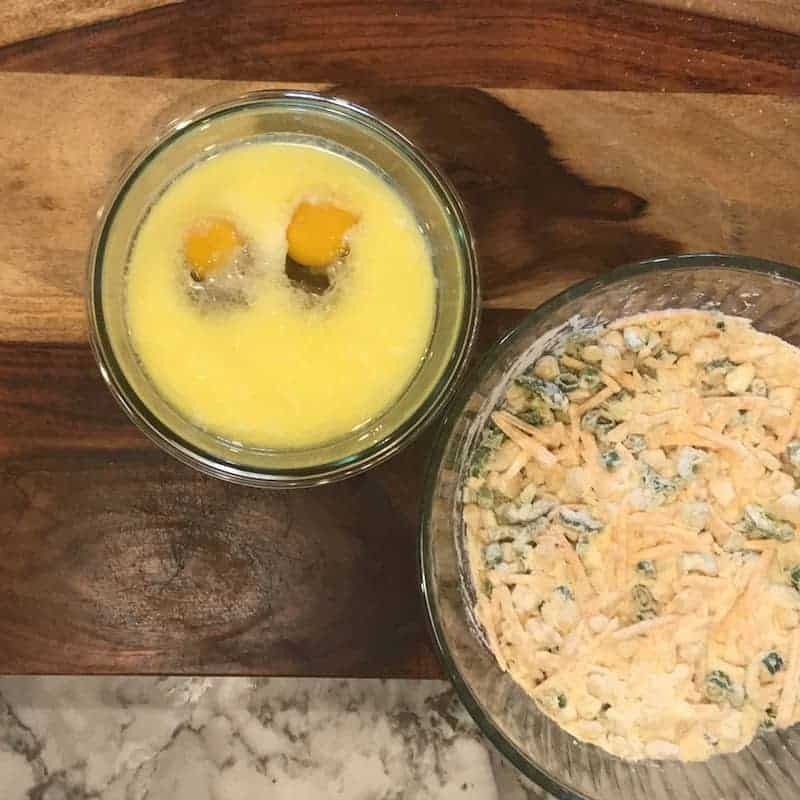 Since squeeze 1 teaspoon of lemon juice in 3/4 cup of milk and allow to sit for 5 minutes as the milk starts to curdle. Depending on the temperatures of the diferent ingredients, fresh Vs frozen corn, or if you have accidentaly overmixed the batter, the cake make not be fully done in 25 minutes. 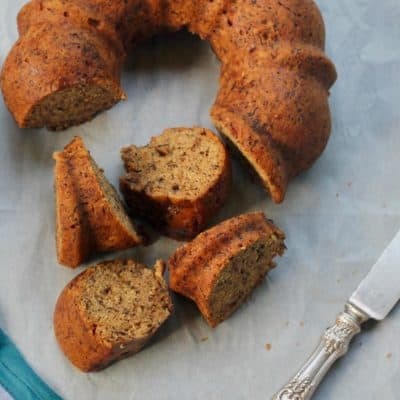 Simply place the cake pan back in the Instant Pot and cook for additional 5 minutes with a 10 minutes natural pressure release. Rava Coconut ladoo – Easy no-fail recipe! This was great! I even forgot to add the lemon juice to my milk and it still turned out wonderful! 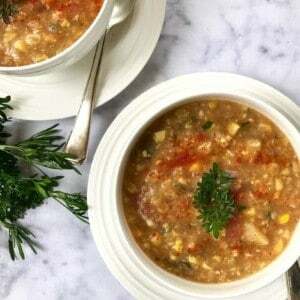 Love all of your recipes, you do a wonderful job of helping novice cooks like me to make healthy and delicious meals. Awesome Amisha!! So Glad to hear this was easy for you to make. Aren’t the flavors simply amazing?? I am in love with this cornbread. The part about covering the cake pan with the paper towel and the aluminium foil is not clear. How do I do that? 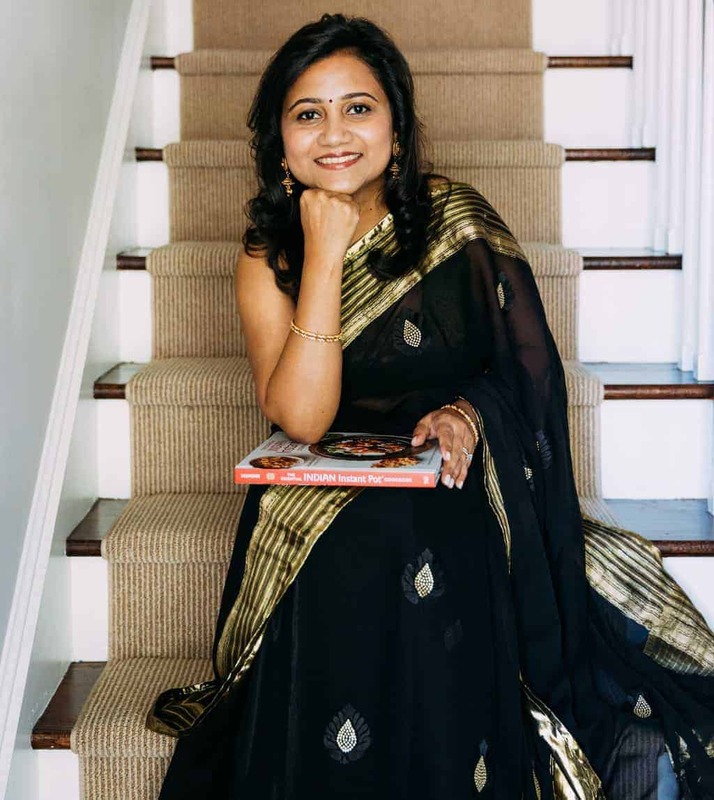 Hi Lakshmi! So you put a paper towel first on the cake pan. 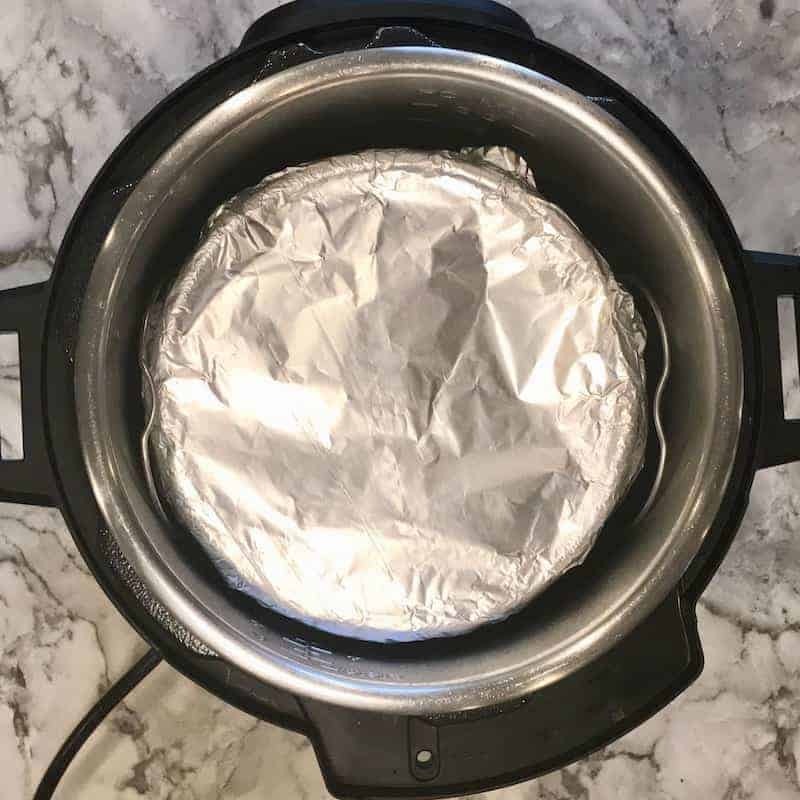 Then you put an aluminum foil on top of it and secure it all around the Instant Pot. This basically helps from any moisture that can get into the cake pan. Hope this is clear. Let me know if you have any questions. it looks so yummy ..and the making is easy too..i will definitely try this..
Hi Albert, Thank you for your kind words. Let me know how you like this cornbread. This looks so appetizing and yummy. Want to make this!!! 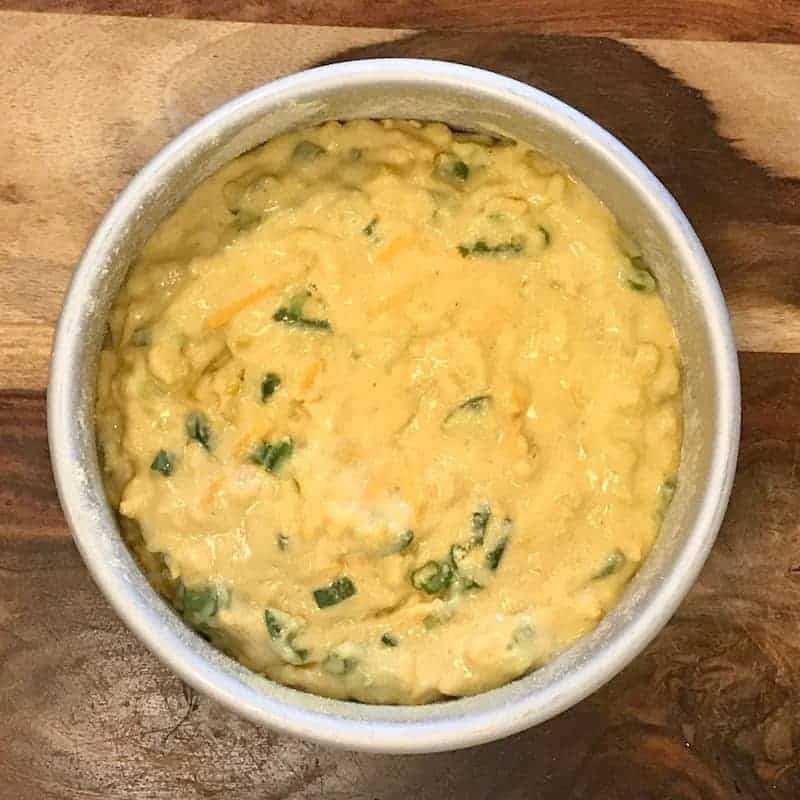 Can this be made without eggs or any substitute for eggs? Hi Mala, I have not tried this cornbread in Instant Pot without eggs. But here is a substitute to try – mix 1 tablespoon of ground flaxseeds with 3 tablespoons of water until fully absorbed and viscous. Use in place of one egg. Or Use 1/4 cup unsweetened applesauce to replace 1 egg. Or use half and half of both options. Let me know how it comes out. Although this is an IP recipe , may i bake it in the oven? How much time and at what temperature? May be keep a bowl of water as well? Hi Divya! You can bake for 20-25 minutes at 375 degrees. It comes out delicious! Hi Claudia, I am sure it will be ok to use white corn meal. 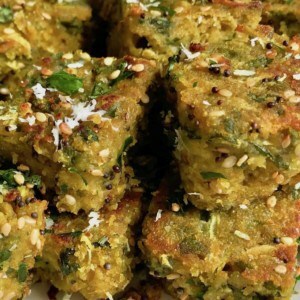 Archana-this truly is a flavorful savory cornbread-best that I have tasted so far. 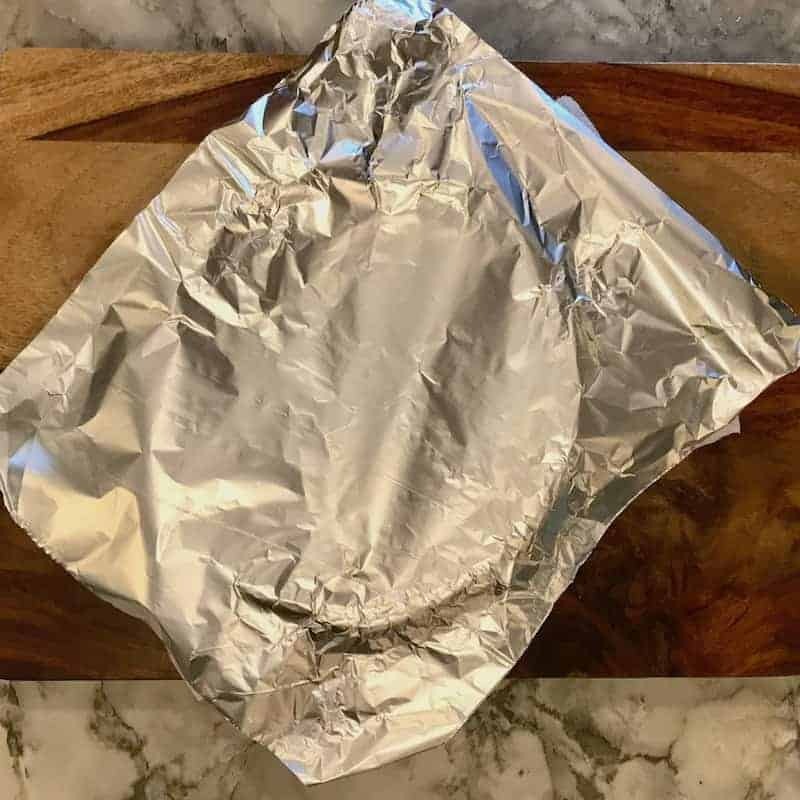 I will definitely use this recipe the next time but I may not make it in the instapot- as my bread rose and stuck to the aluminum foil and the center part remained uncooked-so it ended up in the oven for the final baking. Thank you! The key with this cornbread is not to overmix. But I am glad you finished the cooking in the oven and enjoyed the flavors. When I make this in the oven I sometimes double the recipe and bake it in a large tray. My house smells wonderful with this cooling on the counter. I look forward to breaking into it with a bowl of chili. Made your chicken biryani last night as well and my 9yr old said that she can’t wait for leftovers tonight! A happy house. So glad to have found you through a Facebook link. I’ve tried this several times and it is never fully cooked, so I have to put it in the oven to finish. Also the toppings stick to the paper towel when I pull it off. Hints? Thank you. Not to over mix. Are you using a 7″ cake pan? This recipe is AMAZING!!! I made it in my cat iron skillet and just put in half the amount of jalepeno , cuz I can only handle medium heat 🙂 it was divine! Made it in my convention oven and it’s always moist and perfect. Also used coconut sugar instead of honey (but I always layer honey on top to balance the heat) and gluten free all purpose flour made out of rice. I always use this recipe even if I’m just making regular cornbread! It’s awesome! Thank you for your lovely feedback. I am so glad you enjoyed the flavors. Will it overflow in a 6” or 6.5” pan? How full should the pan be? 3/4? Sounds scrumptious! Will this overflow in a 6″ or a 6.5″ pan? How full should it be – 3/4? Hi Vimmi, every oven is different so may take more or less time. Also corn bread usually is on the drier side. May be you can try it for 35 minutes next time. also what temp did you bake it at? Hi Archana, I follow you many times. Your recipes are great. Hi Kanan, thank you! Do send me the information. 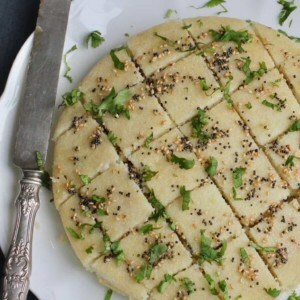 Can I use corn flour instead of corn meal? Hi Ann, Corn meal is much coarser than corn flour. I am afraid you cannot use corn flour for this recipe. I can’t wait to try this recipe. It looks amazing. I have an 8 inch springform pan not a 7 inch. 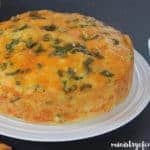 Will my 8 inch work for this recipe and should I adjust the cooking time? It fits in my IP and doesn’t touch the sides. I have an 8 quart IP. I have not tried in my 8-QT but I am thinking it will cook in 25 minutes. But a skewer on to make sure its cooked well if not you can always add another 5 minutes of pressure cooking time. I will try this! Thank you so much. I want to make this but have a couple of questions. In the recipe you call for 1 c cornmeal and indicate we should grease and then coat the pan with cornmeal. Do we coat the pan with cornmeal and the balance goes in the mix or is the amount required to coat the pan over and above the 1 c? 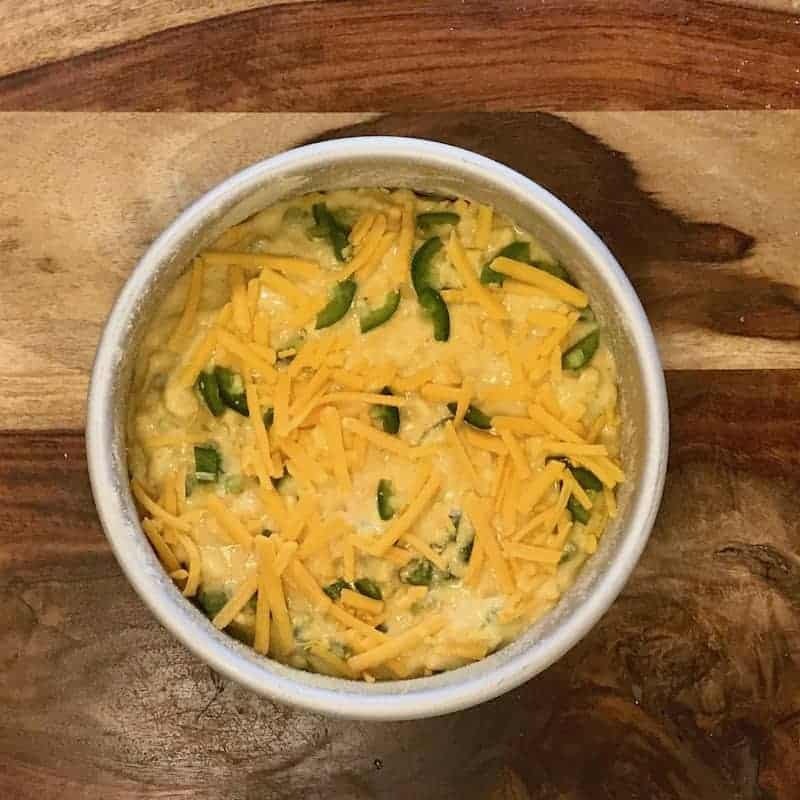 You indicate to save 1 T of the jalapenos, cheese and scallions and though your recipe says to garnish with the jalapenos and cheese, are we to include the scallions or are we to do something else with the scallions which is not indicated in the recipe. Hi Leslie, So you need additional 1 to 2 teaspoon of cornmeal for coating the pan. You add reserved scallions in the end to garnish. I will update the recipes to clarify both your points too. 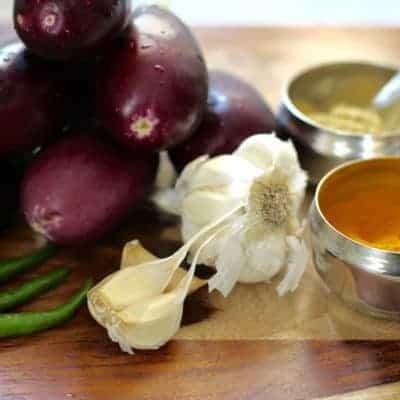 HiArchana, looks like a lovely recipe. I want to make this without the honey. Any suggestions for substitutes – I have coconut sugar and regular sugar at home. Thanks!